So says Patti Smith at the beginning of Steven Sebring’s Documentary on her life and music, Dream of Life. My partner and I went to see Dream of Life, the Patti Smith Documentary on Friday at the Nuart theater in West Los Angeles. Directed by Steven Sebring, the film is structured loosely and nonlinearly. 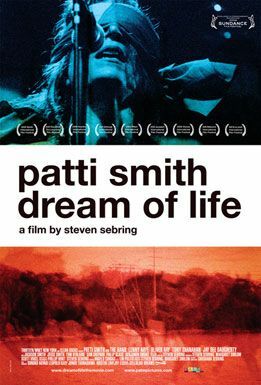 The film is as fiercely poetic and moving as Smith’s extraordinary music. The experience was heightened by the appearances of director Steven Sebring and Patti Smith herself, who was witty, casual and candid. As we were all exiting I found myself beside her for a brief walk up the aisle to the lobby. I wanted to say something, but only an emphatic “thank you” came to mind, and that seemed utterly underwhelming for what I wanted to express. Standing so close to her I found the hair on my arm stood up and my heart raced and it was like being close to live electricity. While she has an intensely magnetic persona, I found her calm and disarming in person. When she was doing the Q&A; after the film she spoke as comfortably as if she were in a room with a few close friends. 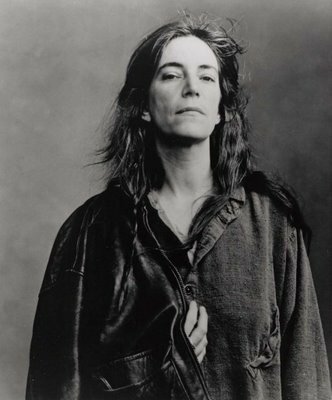 Don’t miss this wonderful film celebration of Patti Smith’s music, life and loves.